Yellowstone National Park (YNP) is one of the greatest natural laboratories for exploring the interactions between the physical world, biota, and humanity. Yellowstone is the world's first national park, and is also a designated World Heritage Site and a Biosphere Reserve Site. The park encompasses 3,472 square miles, including geologic formations that range from Archean basement to Pleistocene glacial deposits; it is a living volcano that has formed one of the world's largest calderas and hosts the world's largest geothermal area; it is home to 50 species of mammals including endangered or threatened grizzly bears, gray wolves, lynx and bald eagles, 1700 species of vascular plants, and uncounted species of microbes living in the extreme environments of Yellowstone's hot springs; and, it welcomes nearly 3,000,000 human visitors per year(YNP Fact Sheet (more info) ). "...to promote and regulate the use of the...national parks...which purpose is to conserve the scenery and the natural and historic objects and the wild life therein and to provide for the enjoyment of the same in such manner and by such means as will leave them unimpaired for the enjoyment of future generations." These principles have set forth a difficult mission for the NPS: to simultaneously conserve and preserve natural resources in the park while promoting the use and enjoyment of the park by the public. This webpage was developed to encourage users to explore for themselves the complex interrelationships within the Yellowstone Geoecosystem and the issues related to use and management of YNP resources. Not everyone will be fortunate enough to travel in person to YNP, but these digital pathways will hopefully reveal interesting and important scientific discoveries about the Yellowstone Geoecosystem and how scientific investigations inform park policy and management. The Yellowstone Geoecosystem provides an excellent opportunity to demonstrate how collections of digital resources can support an Earth system approach to learning. Earth system science focuses on the interrelationships among different components of the Earth system. It reveals the transport and storage of mass and energy throughout the Earth system and the processes that operate on this dynamic, heterogeneous, and complex planet. Global cycling and positive and negative feedback mechanisms are important concepts in Earth system science. Earth system science also recognizes the importance of interactions between Earth and the biota that live on our planet, including humanity. The collection of resources in Exploring the Yellowstone Geoecosystem provides a wealth of information to support learning about this unique place on Earth. This web-mediated learning environment allows learners to readily follow lines of inquiry between related topics, or to dig deep to comprehensively investigate a single topic of interest. Visit Teaching with an Earth System Approach from the Starting Point project for a more complete description of Earth system science, learning resources, and instructional strategies. Garrett Hardin's First Law of Ecology , (and by extension, of Earth system science) is, "Everything is connected to everything else". The Yellowstone Geoecosystem offers something of interest for nearly everyone. Once you've "entered" the Yellowstone Geoecosystem, it doesn't really matter where you start because the relationships between all the components become readily apparent. So, start with something you've wondered about, or choose a topic you've heard about in the news. Motivation for learning is often rooted in activities that are goal-directed, where the task demonstrates knowledge or skills, or that elicits curiosity (see Edelson, 2001 ). Here are some suggested self-guided discovery pathways to explore the Yellowstone Geoecosystem that will hopefully motivate learning by promoting a sense of wonder and curiosity or by creating a compelling need to know. Use these links to find the evidence to address suggested questions, and to develop and pursue your own questions! Start with "A Living, Breathing Volcano". Yellowstone is one of the most geologically active areas in the world. Look at the volcanic history of this system, and the seismicity and surface deformation. Yellowstone Volcano Observatory (more info) contains a wealth of related information. Current seismic activity in the Yellowstone system has lead to recent concern about the possibility of a volcanic or steam eruption, and the potential for related hazards that could impact humanity. The hydrology of the Yellowstone system interacts with volcanic and geophysical phenomena to create the world's largest geothermal systems. Yellowstone's geothermal springs are host to an amazing diversity of microbial life and this unique environment also creates unique habitat for macro flora and fauna. The management of life in the park has lead to some interesting controversies ranging from the issue of bioprospecting for microbial life to the reintroduction of gray wolves into the geoecosystem. Yellowstone Science (more info) is a quarterly publication devoted to Yellowstone National Park's natural and cultural resources. It features articles about research in the park, provides a colloquium for scientists, and offers an opportunity for the public to view this research. Articles can be searched by topic, author, or volume and may be downloaded in PDF format. This source reveals some of the most exciting new science that's being done in the Park. Use these research projects as the starting point to make connections across the Yellowstone Geoecosystem using the additional resources provided in our digital collections. There are no lack of opinions about how the Park should be managed. Should snowmobiles be allowed in the Park in winter? Reintroduction of wolves-a good attempt to restore natural balance, but what about impacts on ranches and wildlife surrounding the Park? 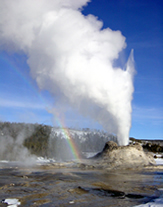 Development of geothermal resources in areas surrounding the Park? Bioprospecting for microbes-a violation of the Park's mandate to preserve, or an opportunity to generate much needed revenue for Park operations? Wildfire suppression-let all fires burn, allow "prescriptive" burns, what is the legacy of a century of fire suppression? Start with a topical issue and use these digital resources to look for the scientific evidence that can inform the decision-making process. Yellowstone played a significant role in the lives of Native Americans in the northern Rocky Mountains. Explore how the natural features affected human activities such as Obsidian Cliff as a quarry site for arrowheads, traditional hunting grounds and trade routes. Learn more about the early white explorers in the area, John Colter (1806) and Jim Bridger, and the Washburn Expedition (1870) and Hayden Expedition (1871) survey that lead to the establishment of Yellowstone as the first national park in the world. And follow the history of the Park as it evolved over the past 130 years. Take a virtual field trip through the history of the Park through Windows Into Wonderland (more info) , and use important points in the Park's history as a point of departure to explore in more detail the geology and biology that impacted the Park's development. These are just a few suggested pathways to explore this amazing natural laboratory. Enjoy the journey through the Yellowstone Geoecosystem.